Unless otherwise noted ALL of our leagues are SOCIAL coed 6v6 leagues 🙂 we’re out there to be active and have a good time! For 6v6 teams average 9 players. We allow individuals, small groups and teams to all join our leagues. JAX Fray reserves the right to add additional players to ANY team that is under the official roster size for the league. During registration captains can pick up free agents or mark their group as ready to merge via commish. After registration closes JAX Fray goes through and finalizes rosters by placing free agents, merging groups and deleting unpaid players. Being a promoted team does not mean you may not receive additional players. Teams who want to “lock” their roster may prepay for a team at the official roster size. Example, 6v6 volleyball is 9 players officially but your team only wants 6 players. You can purchase a team spot for a roster of 9 and only fill your desired number but those additional spots are technically used and are not refundable. How much does it cost to join a JAX Fray Volleyball league? Welcome to JAX Fray - your home for FUN things in Jacksonville! 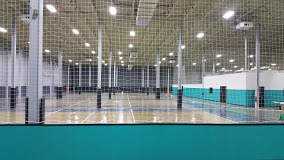 You're about to join our Spring season of Indoor Volleyball in Southside! We're hitting the courts Thursday Evenings for some awesome social co-ed 6v6 Volleyball! Games are from 7:30pm-9:30pm (tentatively) in Southside and you're in the heart of the action! Games will be 6 weeks in length with playoffs afterwards! This is a 6v6 coed SOCIAL division. What does that mean? - This is our credo- people meeting people! Every level will always have our social aspect. For this definition, these are the bulk of our leagues where we want players to come out, play their games but it’s more about making friends and heading to the bar! There’s no skill requirement - new to the sport? Great! Former Pro at Ultimate? Perfect! Everyone is welcome! If you and your friends are looking for a good time and an awesome party, JAX Fray is the way to go. The league will have a staff host on site to ref games. Teams will play 6 vs 6 and are required to have at least 8 players on their rosters. The gender breakdown is 3 females and 3 males on the court for a full team. We welcome free agents and small groups and will do our best to match players to teams! You can sign up as a free agent, group or team. Groups please keep in mind the COED aspect of the league when registering. Make sure to like us on Facebook!! !